Both 5.5" phablets run Android 4.1.2 Jelly Bean with their own custom UI skins on top, and are expecting to get the latest Jelly Bean update soon. Both companies have reached virtually every corner of Android with their respective user interface skins. As of the time of writing, LG is at boasting the latest iteration of their Optimus UI in the Optimus G Pro, while the Note II is packing what is still (before the Galaxy S4 comes to the market) the latest TouchWiz UI. Both are as feature rich as a custom UI can get with usability boosts and software tricks everywhere. Let's start with the lockscreens. Here, both phones offer more or less the same features such as lockscreen widgets, date and weather info (here LG gives you a choice of clock style), as well as shortcuts to apps. it's worth noting that Samsung offers two extra unlock methods - Face & Voice and Motion. The Galaxy Note II also offers a feature dubbed Quick glance. It presents at-a-glance info on the basics - while the phone is locked, you can cover the top of the Galaxy Note II (just trigger the proximity sensor, really) and the screen will light up and display the status bar, counters for missed calls and new messages, a battery percentage, music track info and upcoming alarms. In our unit, this would trigger even if the phablet is face down, so it might prove to be a battery draining feature. Going pass the lockscreen unveils the all too familiar Android homescreen configuration. Both phones allow you to have up to 7 panes that you can rearrange and set which one is the default. The shortcut docks on the bottom fit 4 customizable shortcuts on the Galaxy Note, while LG have given you the option of fitting 7 on the Optimus G Pro. Furthermore, you can fit 5 icons on a row outside this dock - one more than on the Galaxy Note II. Naturally, since both are running Jelly Bean, widgets are resizable (this was introduced in ICS) app shortcuts and widgets move out of the way when you place a new one. The notification areas are similar and both feature connectivity toggles. A helpful trick on both phones is to long press a toggle, which brings out the corresponding Settings menu (e.g. GPS settings if you long-press the GPS toggle). There's a brightness slider on both phablets as well as a shortcut to the settings menu. The LG Optimus G takes an edge here by adding an additional row of shortcuts for QSlide apps. We'll talk about QSlide in a bit. Interestingly, LG has given the boot to its implementation of a simple launcher dubbed Easy Home in the Optimus G Pro. On the Galaxy Note II, the feature is present, and is called Easy mode. Basically, it's a preset with big, thumbable widgets. The cool thing about it is that Easy mode and the default (Basic mode) remember separate arrangements on the homescreen, so you can use one for work widgets and one for personal widgets and easily switch between the two. An advanced feature that Samsung added to TouchWiz is Smart stay - it prevents the screen from locking as long as the front-facing camera can see your face. LG offers its own version of the feature, called Wise screen. LG borrowed the same trick from Samsung's TouchWiz and implemented its own version of Smart Stay - called Wise screen. It uses the front-facing camera to detect whether you're looking at the screen. This means you can browse the phone for hours on end without it auto-locking itself. We can confirm that the feature works very well. We already mentioned the QSlide feature on the Optimus G Pro - LG's way of enhancing multitasking on the phablet. Samsung was first to the market to offers a similar trait, but with a different approach called Multi Window. Multi Window enhances the multitasking capabilities of the Galaxy Note II, allowing you to run two apps on the screen simultaneously. Mind you, not all Android apps are supported, but unlike the Galaxy Note 10.1, where only Samsung apps could be brought up to the screen, Multi-Window supports Google apps as well (Gmail, YouTube, Chrome and Talk). As for LG's QSlide, it too doesn't support all Android apps, and comes with only a short list of supported ones dubbed QSlide apps - QMemo, Web browser, Video, Calendar, Calculator, etc. Depending on the QSlide App that you launch, there are different shortcuts on the bottom bar, joined by an icon to resize the QSlide window. The unique feature here is the slider, which directly controls the opacity of the QSlide layer. This way the underlying user interface can be more or less visible. Unlike the previous version of QSlide, now you can move the QSlide window around the UI to a place you find best. You can also chose whether the foreground QSlide app or background UI to be active. A really exclusive feature of the Galaxy Note II is its S Pen functionality, which is truly is pivotal to the phablet's experience. It has a vast array of features that are a great usability boost over what can be done with just finger tips. The S Pen provides another way to launch apps - with gestures. You press the S Pen button and swipe up to access Quick command. Here you can draw a "@" sign to launch email, "?" to do a quick search, "#" to dial a number or "~" to send a text. Besides the symbol you can add a keyword - what to search for with the "?" or define search range for the "@": recipient, message body or both. The Samsung Galaxy Note II screen can detect the S Pen from a distance, similar to how the Galaxy Note 10.1 worked. The hover feature, called Air View, is not part of the stylus though. Thanks to its more sensitive digitizer, the Note II can distinguish between 1024 different levels of pressure and you can really feel the difference in the drawing apps - you get fine-grained control between thin and thick lines. Here's a video from Samsung that does a great job of showcasing all the S Pen features. 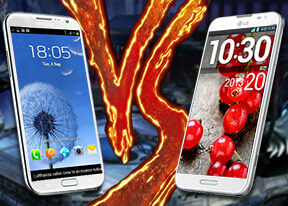 Winner: Samsung Galaxy Note II. While both offer excellently functional user interfaces with a number of cool home-baked treats, the extra dimension that the S Pen adds gives this round to the Samsung smartphone. You can call this a tie if you don't plan on using the stylus, though.